.... Sequencing is a major part of the QC methods we use at iGEM HQ. We sequence all samples that we send out as part of the year's distribution. Before using or requesting a part you should make your own in-depth analysis of the part sample's sequence results. 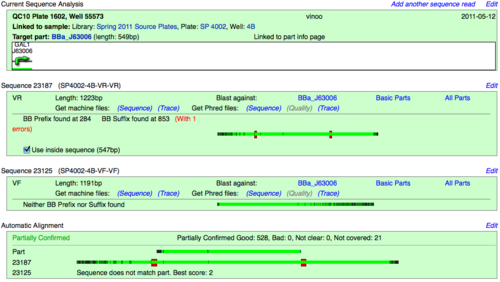 Part samples are sequenced using the VF2 and VR primer sites on their plasmid backbones. The VF2 and VR sites are located on BioBrick plasmids (just one of the reasons why you must send your parts in pSB1C3!). This ensures that the sequence reads will be able to read the BioBrick prefix and suffix as they move inward into the part sample. The VF2 and VR reads should be able to locate the BioBrick prefix and suffix, respectively (Ex. BB Prefix found at __). The quality of the reads begins to drop after several hundred bases. If the part is too long (generally >1kbp) the reads will either not reach into the middle of the part or their overlapping sections will have poor quality. Currently, we only do a single VF and VR read. 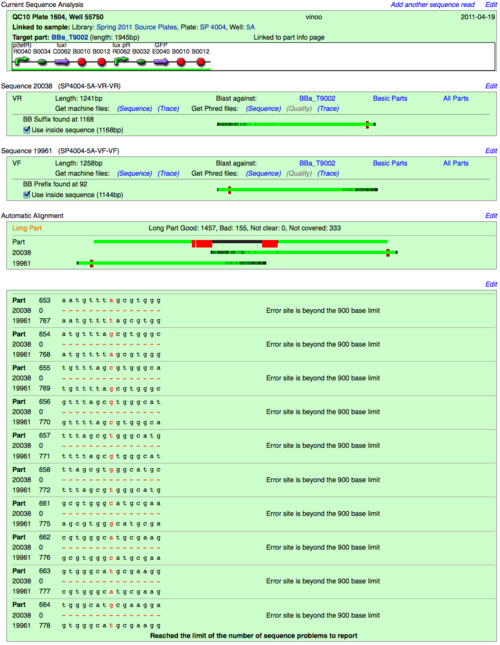 Sequence results are then uploaded and compared to their target sequence (part's documented sequence) through Registry software, and are automatically assigned several qualitative values. Note: We are continuously looking to improve the Registry software and our sequence analysis. If you have any suggestions please send an email to hq AT igem DOT org. To see if a part's sample has sequencing results, you can click the "Get This Part" link at the top of the page, and find if a part's sample/location has QC results. 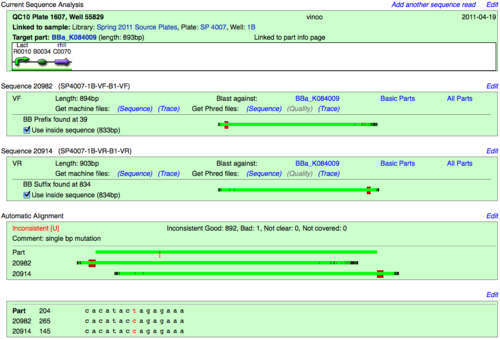 If so, click on the Sequencing link, right beside the part's Sequence result. This will take you to the Sequence Analysis page for your part. We manually reevaluate "Inconsistent" sequences to see if the result was simply a software issue rather than the actual sequence being incorrect. Once a part has been re-evaluated by us or another user, a [U] is added its qualitative value. When possible we also leave comments in regards to the part's status. Confirmed - The prefix and suffix is correct. The part's sample matches the part's documented sequence. Long Part - The prefix and suffix is correct. The part's sample is visibly correct, however due to the limited length of the sequencing reads, the middle of the sample is not covered well or at all. Questionable - The part's sample appears correct with one or two possible mutations. The mutations cannot be confirmed by both VF and VR reads. Inconsistent - The part's sample does not match the part's documented sequence (as proved by both reads). The prefix and/or suffix may be incorrect. Bad Sequencing - The sequencing reads are bad (poor quality). No Part Sequence - The sequence of the part has not been specified. Blast the read against the documented sequence of the target part (BBa_R0062), Basic Parts (non-composite parts), or All Parts on the Registry. A blast against the target part can be looked over for inconsistencies between the subject (documented sequence) and the query (sequence of the read). Displays a visual alignment of both reads to the target part. Sequence result decided by the Registry software or a user [U]: Confirmed , Inconsistent, etc. Below the automatic alignment, the Registry software will display Sequence Problems, specific nucleotide discrepancies between the reads and their target part. The nucleotide in question is colored red, and its locations on the documented sequence of the part, and the two reads are noted. Note: The Registry software has a limit of displaying 10 sequence problems. The length of the sequence reads are insufficient to cover the middle of the part. The ends are confirmed, but middle is not. The software is only able to partially confirm the sequence, in many cases this is likely due to one read being poor. The part matches mostly however a mutation(s) exists. Parts are still marked as Inconsistent, but comments will reflect the nature of their inconsistency. The part does not match at all.